For great albums from Tangerine Dream – each packaged here in tiny LP sleeves, with a small poster too! Electronic Meditation has a title that's a perfect summation of the way that Tangerine Dream approached their music – and it also really describes what made them so unique at the time! Rather than try to push the boundaries of electronics with a sense of force or urgency, the trio of Edgar Froese, Klaus Schulze, and Conrad Schnitzler really take their time – working inside an abandoned factory to create the sounds for this initial debut – acting as their own producers, too – really starting the strong legacy of German experimental recordings of the 70s, in which the studio was as important as the instruments themselves! Given that Schulze would later work in Ash Ra Tempel and on his own famous records – and Schnitzler soon formed Kluster – there's a lot of genesis going on here. But the whole thing's also pretty darn great on its own, even without the history – and has a much darker edge than some later work by Tangerine Dream. Titles include "Genesis", "Journey Through A Burning Brain", "Resurrection", "Ashes To Ashes", and "Cold Smoke". 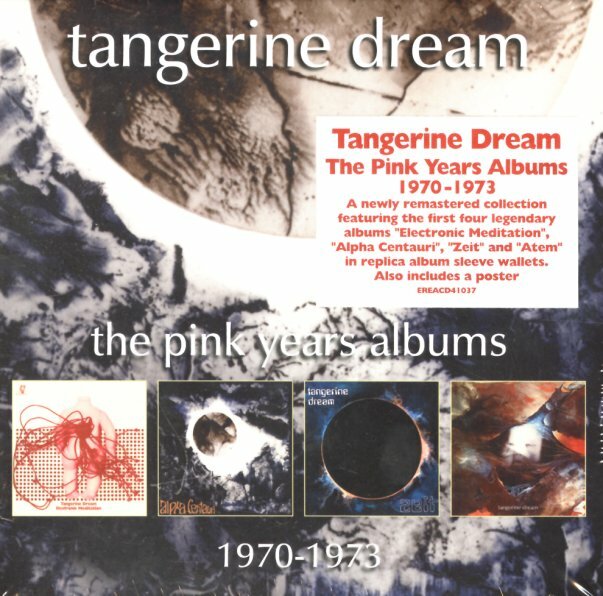 Alpha Centauri is pure genius from Tangerine Dream – a record that came out right at the start of the 70s, and immediately cemented the group's reputation as one of the most inventive electronic acts of the decade! The tracks are long and spacious here – very much in the territory of some of the group's Krautrock contemporaries, but with more of a sense of openness, and patience – as they never rush things at all, while layering together their unique blends of guitar, organ, percussion, flute, and anything else they can think of – even a coffee machine! Chris Franke handles the electronics, but Steve Schroyder abstracts them with "several echo machines" – while Edgar Froese helps them all remember to keep things tuneful at times. Tracks include "Sunrise In The Third System", "Fly & Collision Off Comas Sola", and the side-long "Alpha Centauri". Zeit is one of the moodiest early albums from Tangerine Dream – a record that really lives up to the eclipse on the cover! There's maybe more "bottom" here than some of their other work – swirling shadows that resonate with some of the more isolated sounds – almost as if the group is trying to invent the 4AD production style, years ahead of its time! Titles include "Birth Of The Liquide Plejades", "Nebulous Dawn", "Origin Of Supernatural Probabilities", and "Zeit". Atem has long tracks that maybe bring a stronger current of noise to the music of Tangerine Dream – a set that follows the longer abstractions of the Zeit album, but with even weirder elements too! The sound isn't exactly pre-industrial, but also isn't far off either – and titles include "Atem", "Fauna Geni", "Circulation Of Events", and "Wahn". © 1996-2019, Dusty Groove, Inc.